A geocaching meet-up between 2.00pm and 2.30pm on Monday 22nd April (Easter Monday), outside the old station at Midsomer Norton. This is the next in a series of SideTracked events based on the song Slow Train by Flanders and Swann. Written in 1963, the song laments the closure of many stations and railway lines under the Beeching cuts of that era. on the slow train from Midsomer Norton and Mumby Road"
Midsomer Norton Station, with Down express. View NE, towards Bath; Somerset & Dorset Joint line (Bath Green Park - Bournemouth West). The 09.35 Sheffield (Midland) to Bournemouth West Summer Saturday express is headed by LMS 2P 4-4-0 No. 40569 piloting BR Standard 5MT 4-6-0 No. 73051 and is attacking the 8 miles at 1-in-50/60 climb up from Radstock to the Mendips summit at Masbury. Midsomer Norton railway station (originally Midsomer Norton, later Midsomer Norton Upper and finally Midsomer Norton South) was a station on the Somerset and Dorset Joint Railway between Bath Green Park and Shepton Mallet. It served the town of Midsomer Norton in the English county of Somerset, which was also served by a second station known as Midsomer Norton and Welton railway station on the Bristol and North Somerset Railway. The station was part of the Somerset and Dorset Railway's extension from Evercreech Junction railway station to Bath. It opened on 20 July 1874. The Somerset and Dorset Joint Railway was nationalised in 1948 and became part of the Southern Region of British Railways. The station closed in 1966, with the closure of the railway, under the Beeching Axe. 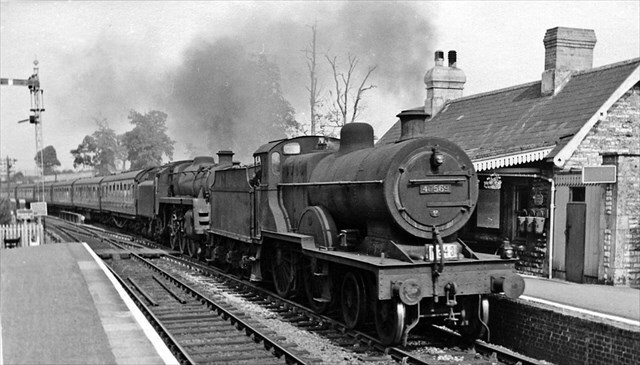 The station was sold in 1969 to a local school, and then in 1995 to the Wansdyke district council, who leased it to the Somerset and Dorset Railway Heritage Trust to restore to its 1950s condition. Today the trust runs an operational railway centre and museum at the site, and are relaying approximately 2 miles of track southwards up the gradient towards Chilcompton. The event will allow like-minded cachers to meet up to chat, discover and swap trackables, and view the site of the old station. Zrrg gnxrf cynpr ba cnirzrag bhgfvqr ragenapr gb fgngvba pne-cnex. Midsomer Norton Station, with Down expressPhoto by Ben Brooksbank, cc-by-sa.